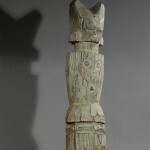 This Kweere pole was used as a ‘Stop Sign’ indicating that behind was an initiation ceremony taking place for girls, marking the transition from childhood to womanhood. The process involved various rites including isolating the girls from the surrounding for a period of time where they were educated about social responsibilities and reproductive implications of menarche and the like. 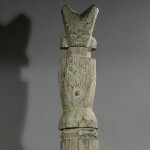 The figure on the top of the pole is a Mwana hiti doll. 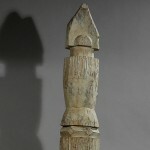 The term Mwana hiti means “female child of the one who is enthroned” and it refers to the girls who are undergoing the period of initiation and training, for they are briefly seated upon the ancestral stool or throne of their mothers lineage when they are presented to the community at the end of their seclusion. This symbol thus celebrates the heritage of these young women, whose beauty, health, and fertility are viewed as gifts of the ancestors. A girl is given the Mwana hiti by her father’ s sister when it is time for her seclusion. After the girl has her hair cut in the distinctive crested stile worn by initiates, she ties tufts of it to the holes in the crest along the head of the mwana hiti. A very personal and highly charged substance, the hair is usually removed before the girl returns the figure to her guardian. The Kwere tribe comprise 50.000 of the population in Tanzania. 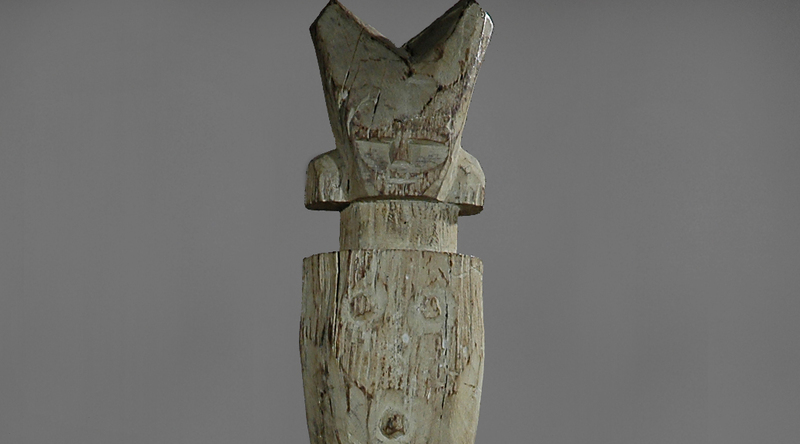 The Kwere people produce various wood sculptures, the best known of which are small doll-like figurines mwana hiti. 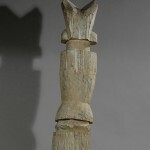 The Kwere carve several variations on this theme, some more abstract than others. Thus all mwana hiti share the same basic form, yet no two are alike.